- FREE download for all summit attendees. 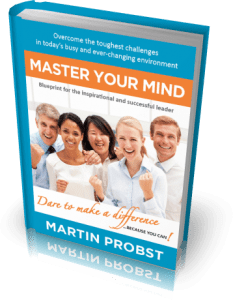 We hope you enjoyed the interview with Martin Probst and his insights into the importance of keeping your cool during challenging situations. As promised, all registered Summit Attendees can download our ebook for FREE. Simply complete the couple of details in the box below and click the “Access Now” button. Take yourself to a whole new level of success. This inspiring book is a game-changer and provides you with effective and proven principles to become a confident and effective leader. It is interactive and filled with invaluable content, illustrations and activities. Through your clear understanding of human behaviour and performance you will bring the best out of people, and enable yourself and them to excel. Master your mind with this groundbreaking leadership methodology. The 344 page book covers topics like confident conflict management, self-management strategies, advanced communication strategies, goal setting, and group dynamics. To download for FREE, simply complete your details in the below box, and click the orange “YES - I want it!” button. If you are also struggling with staying calm and collected during challenging situations, and are often frustrated with your staff, sign up below for the free training video series “The Shocking Truth About Losing Your Cool – 4 crucial questions that must be answered to calmly and confidently deal with conflict” (valued at $144). Find out what is right for you. Book an obligation-free catch up. Let us help you make things easy.